Use Charizard to fly to Tapu Village and heal up if you'd like. 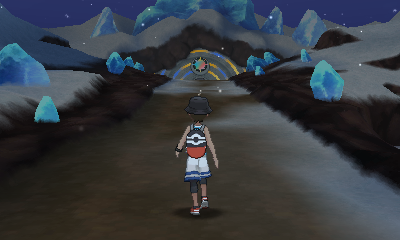 Head north of the Pokémon Center to Mount Lanakila. 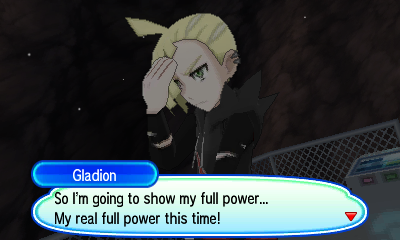 You'll soon be stopped by Gladion. He'll challenge you to a battle. He has a Lv. 53 Crobat, a Lv. 55 Silvally, a Lv. 55 Lucario, and a Lv. 53 Zoroark. After the battle, he'll give you a PP Max. Heal up, then head up the elevator. Head to the right of the grass here to find an Escape Rope. 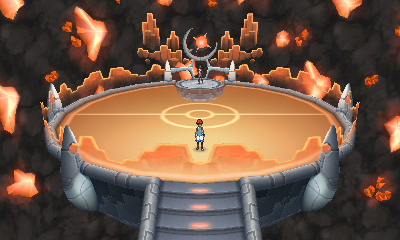 Enter the cave and battle the trainer here. Continue up the trail for a bit and you'll find another patrolling trainer. 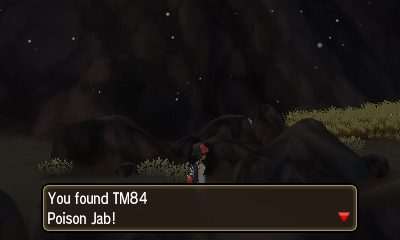 From here, you can head right to battle another trainer and find TM84 - Poison Jab. 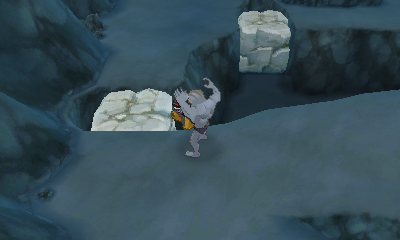 To the north, use Machamp to push the boulders off and create elevated pathways. There will be another trainer, a Max Elixir, and a Max Revive to pick up here. Head north back outside and you'll find a group of four trainers practicing dance moves. If you wait until they turn around, they can be avoided. 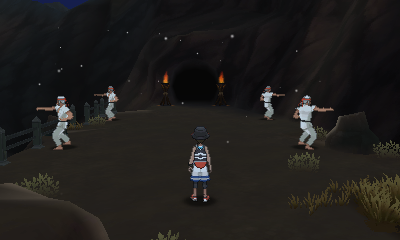 Enter the cave here. It might be a good idea to save your game. 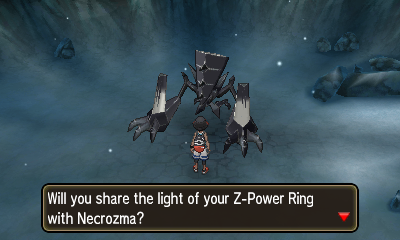 This is your third encounter with Necrozma. This time, you'll be able to catch it. You can use your Master Ball if you wish, but you can also catch it with an Ultra Ball after weakening. We were able to catch it on our first try with a Dusk Ball. Afterward, you'll get Ultranecrozium Z. 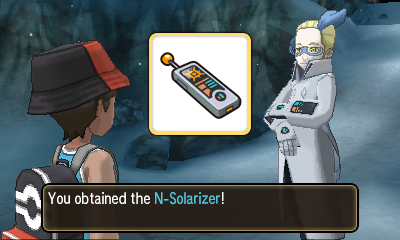 After catching Necrozma, Colress will give you the N-Solarizer and N-Lunarizer. Enter the cave to the right. If you head South in this area, you'll find TM13 - Ice Beam. Further south of this you'll find two trainers and a PP Max. 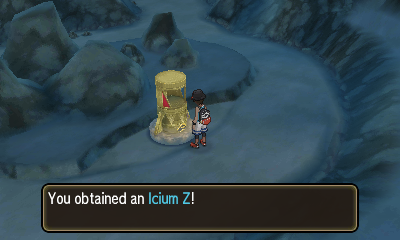 To the north and right you'll find Icium Z on a pedestal, guarded by a trainer. You can also grab a Full Restore in this area. When you're ready, exit this cave to the north. You'll need to defeat at least two trainers on the way out. Continue north to the elevator. Heal up at the Pokémon Center here. It would also be a good idea to stock up on Potions and Revives. 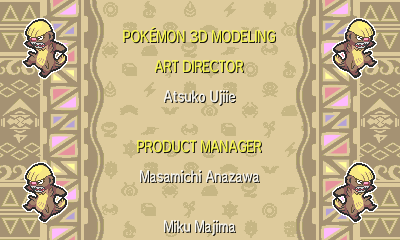 Continue north until you reach Professor Kukui. He'll explain the Pokémon League and Elite Four. Follow him into the building. Enter the door to the left to battle Elite Four Molayne. 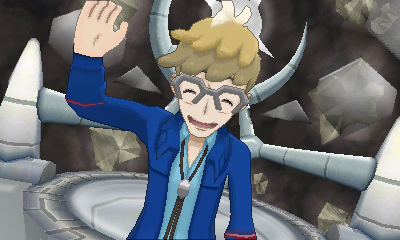 He uses Steel-type Pokémon. We recommend Fire, Fighting, and Ground types to use against him. He has a Lv. 56 Klefki, a Lv. 56 Metagross, a Lv. 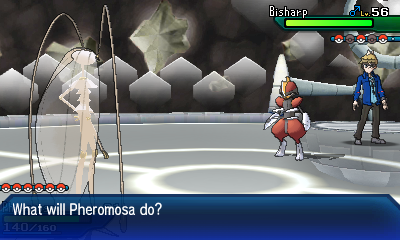 56 Bisharp, a Lv. 56 Magnezone, and a Lv. 57 Alolan Dugtrio. Enter the next door when you're ready. Olivia specializes in Rock-type, so Water, Grass, and Steel are recommended. She has a Lv. 56 Armaldo, a Lv. 57 Lycanroc, a Lv. 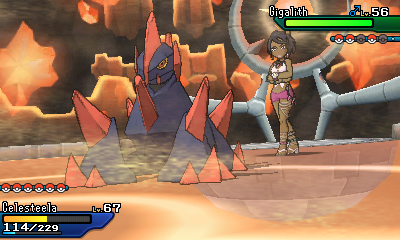 56 Gigalith, a Lv. 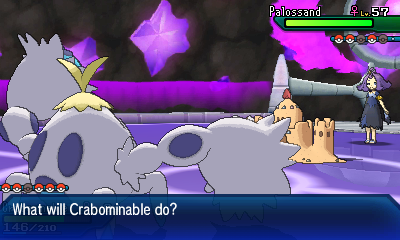 56 Probopass, and a Lv. 56 Cradily. Enter the next door after healing up. 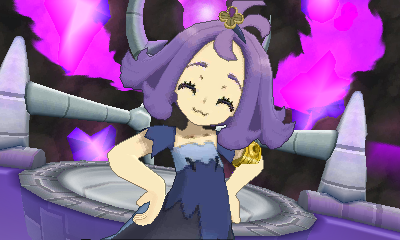 Acerola is a Ghost-type master. Dark-types are your best bet here. She has a Lv. 56 Banette, a Lv. 56 Dhelmise, a Lv. 57 Palossand, a Lv. 56 Froslass, and a Lv. 56 Drifblim. Make your preperations and enter the final door on the right. Kahili uses Flying-type Pokémon. She has a Lv. 56 Braviary, a Lv. 56 Hawlucha, a Lv. 56 Mandibuzz, a Lv. 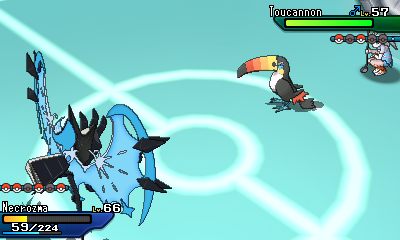 57 Toucannon, and a Lv. 56 Oricorio. 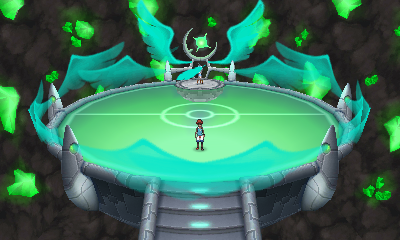 After defeating the Elite Four, climb the stairs and examine the pedestal. 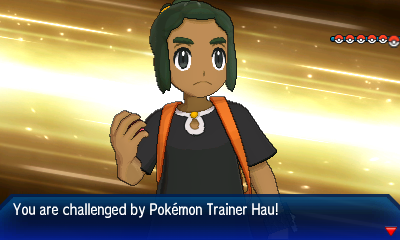 Professor Kukui will inform you that there's one more challenge before everything's official: you must beat your rival Hau. He has a Lv. 59 Raichu, a Lv. 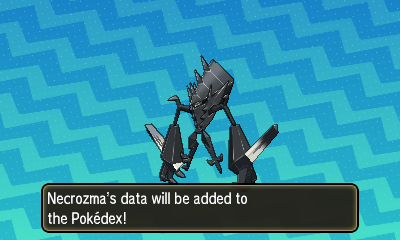 59 Crabominable, a Lv. 58 Noivern, a Lv. 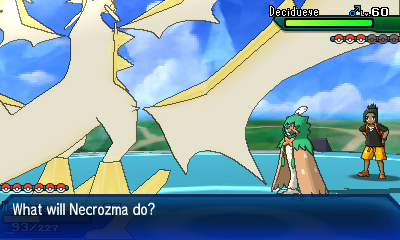 60 Decidueye, a Lv. 58 Tauros, and a Lv. 58 Vaporeon. Congratulations! 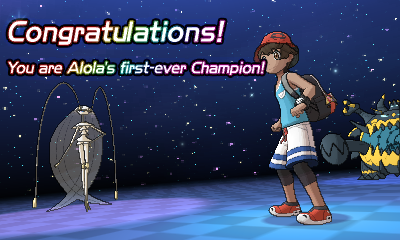 You're now the Alolan Pokémon League champion, and Pokémon Ultra Sun or Ultra Moon is now complete. Now onto the post-game!